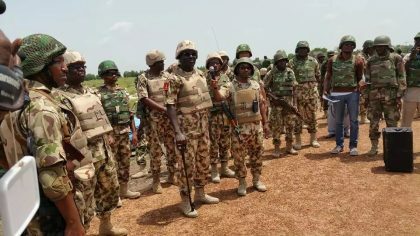 Abuja, SK Usman: The attention of the Nigerian Army has been drawn to an online publication circulating mostly on the Social Media that the Chief of Army Staff, Lieutenant General Tukur Yusufu Buratai, has been wounded in an alleged ambush by Boko Haram terrorists at an unnamed location in the North East while on his way to pay troops courtesy. This is not true. The Chief of Army Staff has not been involved in any ambush. In any case, there was no any recently reported ambush against any of our troops anywhere let alone in the North East. The public should disregard the ambush story as it is fake. Nothing has happened to the Chief of Army Staff, he is hale and hearty and conducting his official duties diligently. The gallant troops are currently dealing decisive blows on the Boko Haram Terrorists in the Lake Chad area. Over 60 of the terrorists have either been captured or neutralised in the last 3 days. The Nigerian Army is also closing up with the political Boko Haram terrorists and their collaborators. They will soon be exposed and the law will take its course against them. We wish to use this opportunity to thank the teeming Nigerians that called and showed concern over this unfortunate fake news. We wish to assure you that no amount of mischief or campaign of calumny under any guise will distract the Chief of Army Staff from his determined efforts of leading a responsive Nigerian Army in the discharge of its Constitutional roles.